I got two mahogany trophy display cabinets a while back which I thought would make the perfect fabric storage unit and the other perfect for my books and journals. They arrived dusty, covered with spider webs, terribly painted on the inside and very unloved.Â Slowly their make-over is taking place: First I had to clean them up and get the glass doors. Now I am attempting the beautification process, step-by-step, starting with some vinyl cutouts for the glass fronts. The inspiration for the birds on the wobbly wire came from a wrapping paper that I got for my birthday. I loved their fun style and started drawing my own. These did not look as great and so the above family is a mix breed of my birds and those from the wrapping paper. I especially love the two that are falling in love, the bird who discovered he could fly (and those left on the wobbly wire looking up in utter amazement) and the bird passing a flower on to another. To see photographs of the cabinet in it’s original state and the make-over in process see my flickr set. This entry was posted in DIY Projects and tagged bird cutout, bird vinyls, decorate, furniture, glass front, mahogony cabinets, make over, redo, Silhouette, trophy cabinets. they are so cute! Haven’ t we all at some point or the other drawn some birdies like this… situation I mean. Who was the heretic that painted mahogony wood!!!!!!!!!!!!!!!! hahahha natural wood… much better. Thankfully not the whole cabinet was painted, just the interior (which makes stripping it all that harder). It is terrible how 50 years ago or so ALL wood was painted (in my great granny’s time). In my house in Fish Hoek we have the most gorgeous wooden wardrobes out of Oak. They are carved beautifully in the art nouveau style and some of two of the wardrobes came from down the family tree. These had two layers of paint on (avo green and white) before gran and mom stripped them. That was a bad and unfortunate trend becuase I think a lot of beautiful wooden furniture got damaged as a result. 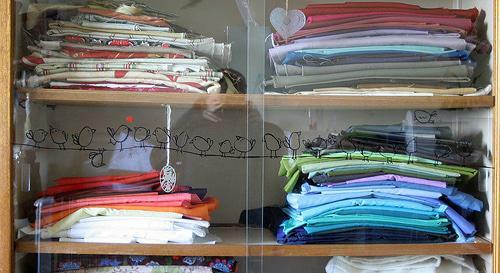 Really cute birdies!Your fabric cabinet looks great! that’s totally gorgeous and really inspiring – I feel the urge now to go on Ebay and find myself some old furniture to lovingly restore to it’s former glory! 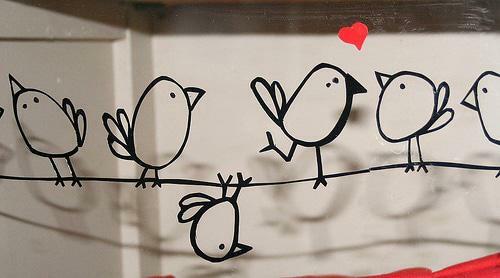 OOh, how can i get some of those beautiful birdy cut outs for my shop wall?! Your little bird design is so stunning, I love it! Imagine rows of birds on a wire, it would make a great wallpaper!